Besides Dessert, Breakfast is another important meal of the day. I strive to make my life (and yours) easier, and still with great results. To add to my easy and popular 1 Minute Microwave recipes, I’m showing you how to take breakfast to another level with 3 BIG & BOLD microwave mug breakfasts: a Blueberry Muffin, Cinnamon Roll Cake and Chocolate French Toast!! Plus, get a BONUS video recipe for an Apple Pie Oatmeal created first for www.BiggerBolderBaking.com. So let’s get microwaving! Just like a freshly baked muffin, this muffin is light and fluffy in texture yet made so simply. Adding the streusel is a must because just like muffins it creates a lovely, sugary and crispy layer on top. It’s just delicious! In a microwave safe mug mix together the first 6 ingredients until smooth. In a small bowl, rub together the streusel ingredients with a fork until butter pieces resemble bread crumbs. Sprinkle streusel on top of muffin batter, spreading out evenly across the surface. Microwave for 1 minute or until it is firm to the touch on top (timing is based on my 1200W microwave so your timing might vary). 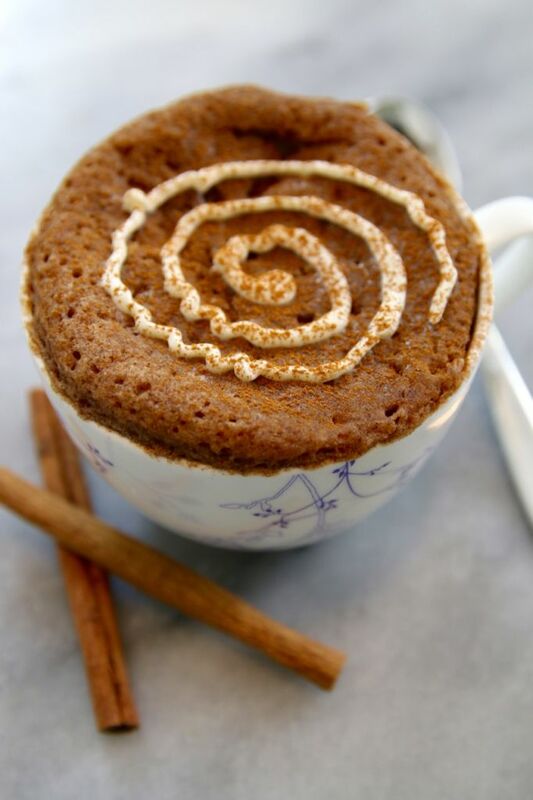 This Cinnamon Roll in a mug takes all the ingredients you love from a traditional cinnamon roll like cinnamon and cream cheese and combines it in this simple mug cake with a lot less mess. When you need that quick cinnamon fix, this cake is a must for your repertoire. Combine all of the ingredients in a microwave safe mug then whisk together with a fork until combined and smooth. Cream Cheese Icing: mix all of the ingredients together until smooth. Serve warm topped with cream cheese icing. French toast is an incredibly easy breakfast. I love it because it uses ingredients you nearly always have on hand. And now you can make it even faster with less mess and wash up. 🙂 You can add whatever you like to your French Toast or just keep it plain Vanilla. I’ll show you how I make it BIG & BOLD with some lovely chocolate. Add the chocolate chips to the mug and give a little stir to incorporate them in the mixture. Let it stand for 5 minutes for the bread to soak up the custard. Microwave for roughly 1-1½ minutes. I suggest checking it after 1 minute and go from there. The timing is based on my 1200W microwave so yours might vary. Find my NEW Microwave Mug Meals here! Oh my god Gemma the blueberry muffin is such an incredible recipe! I posted a picture and the end result looks almost exactly like yours! Very filling and very flavorful for such a simple batter. I couldn’t do the streusel because I had margarine instead of butter so it would make a paste instead of a crumb. But, I found at home some Honey Maid, a kind of graham crackers that you can use to make a crust. I crushed some in a bowl and putted it on top. The taste was amazing. Hello! I’m so happy to hear you liked it! Next time send us a photo! Yes, where a baking powder is called for with all purpose flour, then use self raising flour and leave out the baking powder, all will be well. Made this today. Only had multigrain bread and subbed in frozen blueberries for the chocolate. It was a little mushy which I thought was because of the blueberries. Having reading comments it’s because I realize I didn’t use enough bread cubes. I thought 5T would be about one slice of bread… oops. 100% will try again with more bread. The flavour was spot on! Good, every day is a school day, and a poor day when we do not try something new, and learn! Yes, for most recipes a nut milk can easily replace animal milks. Hi Gemma, Thanks for the amazing recipes you share. I want to try the mug meals but would like to know if I can bake them in the convection oven instead of the microwave. I understand that the time taken will be more. If you have any inputs on baking mug meals in normal convection mode it will be very helpful. Yes! You certainly may. The issue is in the cost of baking just one item. If you are baking these in a large oven then bake more than one, use a muffin pan, and share! The muffin paper cases help too. Some of the other savory type recipes can be prepared on the stove top too. Try them! Do you have any suggestions for me in the future? To try out? I tried the french toast this morning for breakfast! It was great but I used m and m’s because I didn’t have regular chocolate and it made it too sweet. I think I also but too much chocolate but the entire thing was too sweet. In the future I would leave out the chocolate and maybe go for some frozen fruits or even just plain with a little powdered sugar. It would recommend this recipe though!! It’s great, I love it! Will defiantly do this recipe again! I’m thrilled to hear you like them!!! I’m going to check out your photos now. I made another French Toast in a Mug. This time I added cinnamon and diced peaches. So yummy!! Brilliant – French Toast in a mug and so quick!! My breakfast routine thanks you!! I made the french toast with leftover bread crust and let it soak overtnight (my mother always says the secret to perfect french toast is stale bread, anyway!). It was amazing! I added only a bit of dark chocolate chuncks and topped it with frozen raspberries. Now I know what I am going to eat for breakfast every time I finish a loaf of bread and there’s only the crust left! you and I must have the same mother! Mine would say that too, for bread and butter pudding this is perfect! Hello Gemma! I am happy to say that we tried the French Toast mug and it turned out amazing! We doubled the recipe so there was more and we decided to add a sprinkle of cinnamon on mug before we put it in the microwave. The cinnamon made it delicious even thought it was delicious without it but we thought we should add a little bit of spice! Thank you for creating this amazing recipe everyone loved it! We had the french toast mugs for breakfast and we have been trying more! Lovely that you added your own touch to this recipe. It really is important to do that too, then it becomes your recipe! Love your recipes. Can you please make more vegetable and/or meat mug recipes? Thanks for considering this possibility. Yes, and we will do that too. The E-Book available here (https://www.biggerbolderbaking.com/gemmas-mug-meals/) can be downloaded too, and will add to your repertoire. Hey Gemm..!! can we use Wheat flour instead of all purpose flour..? will there be any change in the batter or recipe ? Yes you can use whole wheat flour no problem. I tried making the French Toast but it came loose from the cup and feel out of the dish. aw man, it fell out? That is very weird… I don’t know why that would happen. Haha, another big smile today for me, yes, I feel for you, lots of cookery books, to read, but no intention to bake. Now you are going at it, and I am happy that you are doing it here with us. The recipe states that you need 5 tabelspoons of cubed bread. would that be about 2 slices? Its hard to measure cubed bread in tablespoons. Yes, you are right, it is hard to measure some foods in tablespoons. I would say you are about right, depending on the thickness of the slice. 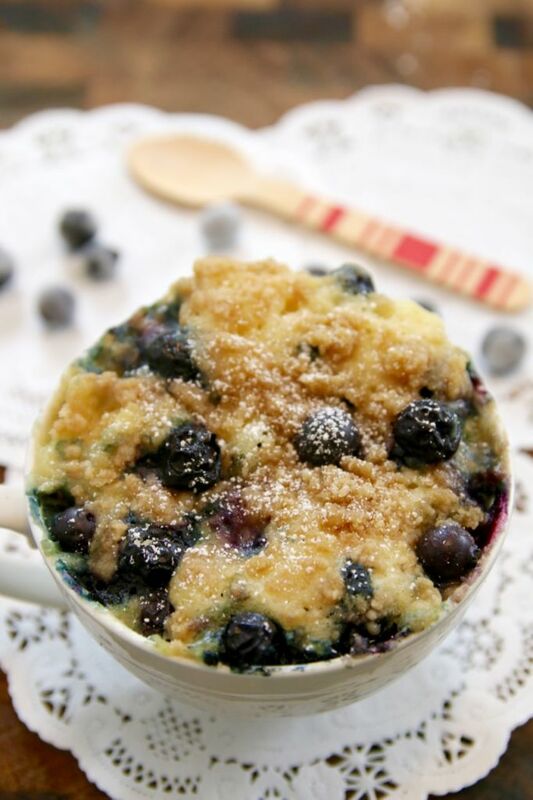 Smooth, velvety……This blueberry muffin is amazing!!! I made French toast today for breakfast its heavenly. I recently discovered your wonderful recipes in a mug! Tried the blueberry muffin followed it carefully, but its was more sticky in inside. But gosh it’s delicious! What do you think I forgot? I recently discovered your mug recipes. Living in a hostel with not much to work with except a microwave at hand, these mug recipes are absolutely perfect! It is like rubbing the mug and making any dish of your choice appear before you within minutes. They go perfectly with your milkshake recipes. I would love to see smoothie recipes with lots and lots of fruits. Thanks for sharing your recipes and keep coming up with new ones! Ah! that is so nice to hear. There are so many people now with limited cooking facilities, students as an example, and i know that these are a great help for all of you. i am happy that you are enjoying these recipes, lots more to come! I made the French toast and it was great, however I was left with a large amount of cooked egg in the bottom? How did this happen? I’m delighted it tastes great :). Thanks for trying my recipes. Can these breakfast mugs be made the night before? Mine turned out mushy and I had a watery liquid at the bottom. Where did I go wrong? I made the French toast. I cooked it for the time the recipe said and it wasn’t cooked. I cooked it a little bit more (20 seconds or so) and it seemed like the egg was cooked but the bread was mushy. I am thinking this has something to do with the shape of your cup/mug. These recipes work best in a wide cup, the heat distributes better. If you allow the cake to stand for about a minute at the end of the cooking time, the heat will distribute, and the food will cook evenly. I made the French toast for my wife and she loved it. Thanks for these recipes, it makes cooking easy for persons like my self who are novices in the kitchen. Great site. Thanks. Next time follow the recipe exactly, when you change the ingredients you change the results. Well dome though! Hi Ashley, I think I responded to this one yesterday, but in case I did not here goes! I am wondering about two things. 1. the shape of your cup/mug. This matters because of the way microwave heat is distributed. A wide vessel works better than a tall narrow one. 2. The time of baking. I say press the top of the cake a few times during baking, when it feels firm to the touch, it is baked. Also allow to stand for at least the baking time to allow the heat to distribute. I tried the blueberry muffin this morning, it tasted great but the muffin was very dry in some places and partly done in others. I was wondering if it was my fantastically terrible mixing skills or if there was something else I was doing wrong? Hello! I want to make these but my microwave ins’t so great and cooks mug meals pretty bad. What temp should I use if I bake it? Can i replace the vegetable oil with sunflower oil in the blueberry muffin? I simply love your mug recipes. They are fab! I have tried the Brownie in a mug and it turned out great! Thank you so much for all these amazing mug recipes! They are perfect for a college student like myself, especially when I need a little treat. Thanks Gemma! Hi Gemma! I absolutely love the cinnamon roll cake, and I made it again (for probably the tenth time haha) this morning. I won’t lie, I’m not the hugest cinnamon fan, so I replaced a quarter teaspoon of it for a quarter teaspoon of nutmeg. It takes the cake to the next level! I’m definitely sticking with that version from now on. Next time I also think I’ll try to replace some of the flour with quick cooking oatmeal, do you think it’ll still work for the microwave? Thank you so much for all the mug recipes by the way, they’re so fun! If you have a grinder, blitz the oats to make a flour, this will work better for you, experiment with this to get it right for you. it sounds like you already know how to do that! I made the French toast and I have one suggestion to everyone who makes it, use cubed bread rather than regular sliced or cut the pieces bigger because the liquid kind of just makes it mush. Still tastes great though! That’s what I did too it really helps! I made the blueberry muffin, and it was delicious. But the streusel cooked much faster than the muffin, so i had to remove the top and microwave the muffin again. Is it because I put too much flour in the streusel? Could you make some recipes that are healthier please? Ah! I am sorry to hear that this was an issue for you. I am not sure why this was so, perhaps a little change in the recipe. I am happy that you got there somehow!